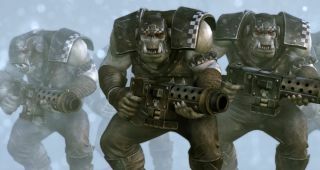 We've seen a few trailers for the upcoming Warhammer 40,000: Regicide, the Orks-versus-Space Marines game of chess that's set to hit Early Access in May. But what we haven't seen is a look at how the game will actually get from the gentlemanly "rook to queen's bishop 4" to the more visceral "Nob guts Space Marine with Big Choppa"—until now. Regicide turns are split into two parts. First comes movement, which is very chess-like, with one piece moved per turn. Once moved, pieces can spend initiative points to use specific abilities. Unit abilities are attached to every piece on the board, but vary depending on the type of unit, while Player abilities, like the initiative-granting Righteous Fury, are "off-board." The stronger the ability, the more points it costs; initiative points are drawn from a pool, so managing them to ensure you don't run low at a critical time will presumably be a big part of the strategy. That sets Regicide apart from Battle Chess, the Interplay classic to which it's sometimes compared, which, amusing animations aside, was straight-up chess. Pieces would fight when they met, but the outcome was never in doubt, whereas in Regicide a bad maneuver might be salvageable, and even end up advantageous, with the help of some wisely-spent initiative and a bit of luck. Warhammer 40,000: Regicide is scheduled for a full launch later this year. Find out more at the official site.